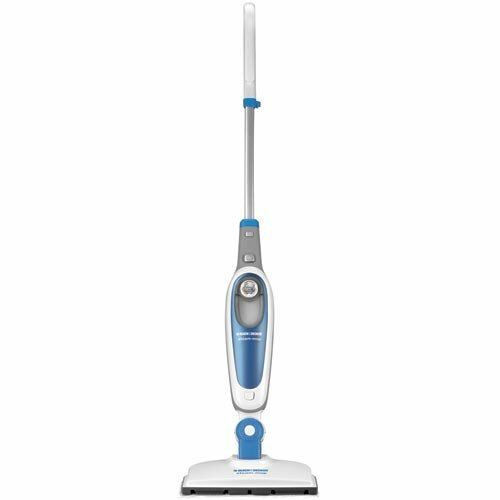 Move over mop and bucket-- Black & Decker introduces the intuitive steam mop with Smart Select technology. Smart Select ensures a thorough yet delicate cleaning on all sealed hard floors including tile, vinyl, stone, marble and even hardwoods and laminate. Simply select your floor type on the Smart Select dial and the steam mop automatically releases the right amount of steam for the perfect clean. It cleans dirt you can see and kills germs you can’t, including 99.9% of bacteria and dust mites. Easier than a mop and bucket, the steam does the work for you--killing 99.9% of germs--while the microfiber pad traps dust and dirt. Designed to clean floors throughout your household, the steam mop includes settings for stone/marble, tile/vinyl and wood/laminate floors. Smart Select technology ensures a thorough, safe cleaning--even on sealed hardwood floor. The low profile design allows you to clean under furniture without moving it. Simply move the mop into the standing position if you need to take a quick break while cleaning and place it on the included mat-- the steam will automatically stop flowing to prevent floor damage. The steam mop uses regular tap water to provide a deep down clean throughout your household--no need to worry about harsh chemicals, fumes or residue. The included microfiber cleaning pads effortlessly glide across the floor to lock in dirt and grime. Specially engineered swivel steering allows you to easily maneuvers around furniture and into corners, making it simple to clean hard-to-reach places. Steam evaporates quickly to leaving your floors sparkling clean and streak-free. Unique low-profile design allows you to easily clean under furniture without moving it, so mopping is never a chore. Safe for pets and children-- uses only water to create steam. No need for chemicals to kill germs and bacteria, the heat of steam alone can kill 99.9% of germs and dust mites. Steam cleaning allows for a thorough cleaning experience without using toxic chemicals. Tank heats up in 15 seconds and changes from red to blue to alert you as soon as the mop is ready to steam. Cleaning pads are washable and reusable to reduce waste and save you money. Simply machine wash, dry and reuse. 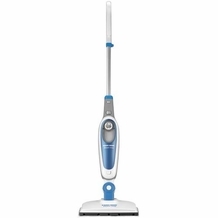 Mop automatically stops steam when parked upright so you don’t have to turn steam off and on every time you pause. With hands-free pad removal, dirt sticks to the mop and not to your hands. Just step on the tag to release the cleaning pad. Pads are machine washable and reusable-- just throw them in the washing machine after your clean. Large water tank allows you to clean uninterrupted for more than 25 minutes on one fill-up. The steam mop is designed to store easily, either standing upright on its own or hanging on a wall. Cup and lid are attached so there is no need to worry about losing them when not in use.